You would like being friends with Leo. He likes to draw, he makes delicious snacks, and most people can't even see him. 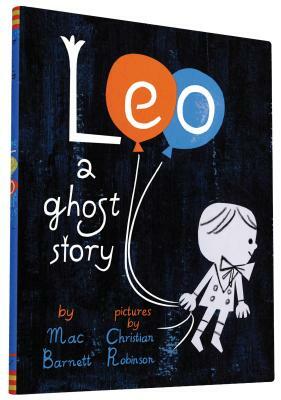 Because Leo is also a ghost. When a new family moves into his home and Leo's efforts to welcome them are misunderstood, Leo decides it is time to leave and see the world. That is how he meets Jane, a kid with a tremendous imagination and an open position for a worthy knight. That is how Leo and Jane become friends. And that is when their adventures begin. This charming tale of friendship—from two of the best young minds in picture books: the author of the Caldecott Honor–winning Extra Yarn and the illustrator of the Bologna Ragazzi Award–winning Josephine—is destined to become a modern classic that will delight readers for years to come. Mac Barnett is the New York Times bestselling author of many picture books, including Telephone and Extra Yarn, which won a Caldecott Honor, the Boston Globe–Horn Book Award, and the E.B. White ReadAloud Award. Mac lives in Berkeley, California. Christian Robinson has illustrated several acclaimed picture books, including Josephine: The Dazzling Life of Josephine Baker, which received the Coretta Scott King Honor, a Robert F. Sibert Honor, a Bologna Ragazzi Honor Award for nonfiction, and a Boston Globe–Horn Book Honor. He lives in San Francisco, California.